Blonde and Brown Cupcakes , originally uploaded by Bev (SugarBloom Cupcakes). 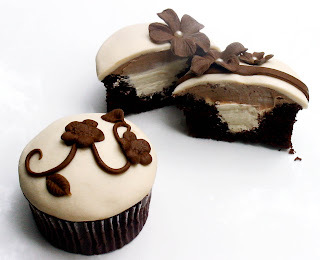 Dark fudgy chocolate cupcakes filled with smooth vanilla bean mousseline buttercream, topped with creamy dark chocolate buttercream and finally covered in a layer of ivory white chocolate fondant. Dark chocolate fondant decorations and sugar pearls. Is there any way to get these in the US? These are beyond FABULOUS! I would love to have them for my wedding.